This is the 125th edition of the Epileptic Gibbon podcast music show and the playlist to accompany it. CLICK HERE TO LISTEN. You can also listen via Mixcloud here. 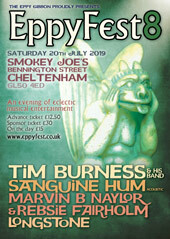 This is a special edition of the show looking ahead to this year’s EppyFest 3 live event at the Lansdown Hall in Stroud on Saturday July 5th. There will be tracks from all six of the acts on the bill: I Am Your Autopilot, The Fierce and The Dead, Thumpermonkey, Andy Pickford, Henry Fool & the headlining act, Flutatious. In addition, the feature album for this show is ‘Sleep Furiously’ by the aforementioned Thumpermonkey so you’ll hear three tracks from that. You’ll also hear tracks from a few non-EppyFest acts including Mark Hollis, Jethro Tull, Trojan Horse & Bubblemath. Below you’ll find the track list, plus weblinks to where you can find more information about each artist and EppyFest. Total running time: 2 hours and 19 minutes. Downloaded file is 127.7 MB. This is the 108th edition of the Epileptic Gibbon podcast music show and the playlist to accompany it. CLICK HERE TO LISTEN. You can also listen via Mixcloud here. This edition of the show represents the fifth (of five) of my rather delayed ‘Best of 2012’ shows, and finally features the second half of my top 21 countdown of my very favourite releases of last year, otherwise known as my top 10. There’s no feature album this time around, just lots of great music from the UK, the US, & Canada. Below you’ll find the track list, plus weblinks to where you can find more information about each artist. Total running time: 1 hour & 31 minutes. Downloaded file is 82.9 MB. Please note: The tracks below are in order of appearance on the show, not in countdown order of my favourite albums of last year. This show covers albums 10-1. For a chance to win a copy of either ‘Little Battles’ or the first She Makes War album ‘Disarm’ just answer the following question: What is the title of the new She Makes War Audiovisual EP due out on 26th August 2013? Then leave me a message on the Eppy Gibbon Podcast Show Facebook group or send me (Ian Fairholm) a message on Facebook with your answer and your choice of album. If you win I’ll also need a postal address. Depending on how many answers we get I may put them into a hat and pick out the winners. Congrats to the 10 bands/acts above that helped to make 2012 such a top year for music. Also, many thanks to everyone involved with this show, musicians and listeners alike. Please leave a comment if you like what you hear (or even if you don’t… feedback is so important!) or if you want to have your say on anything else connected to this podcast. If you want to keep up to date with news about the show, EppyFest, or just chat with other listeners, don’t forget that there’s a Facebook group – just search for the Eppy Gibbon Podcast Show on Facebook and request to join – you can also take part in the She Makes War competition via Facebook. With the next show we’ll be back to normal (or as normal as we get! ), focusing mainly on 2013 releases, but with a smattering of older tracks too, including a terrific feature album. I do hope you’ll come back for that.